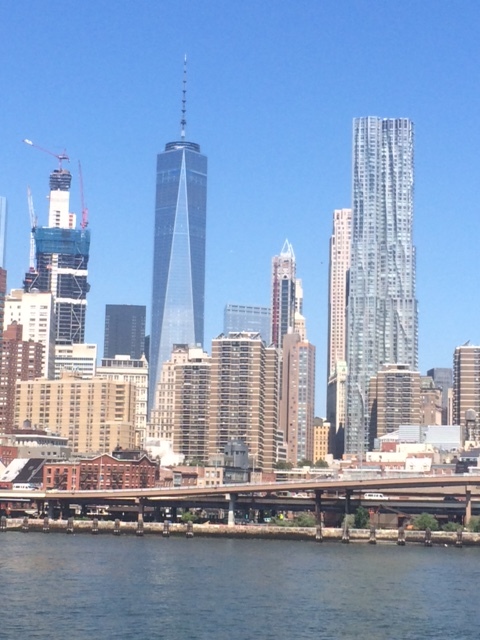 Trip Log – Day 257 – New York, NY to Red Bank, NJ | How Will We Live Tomorrow? 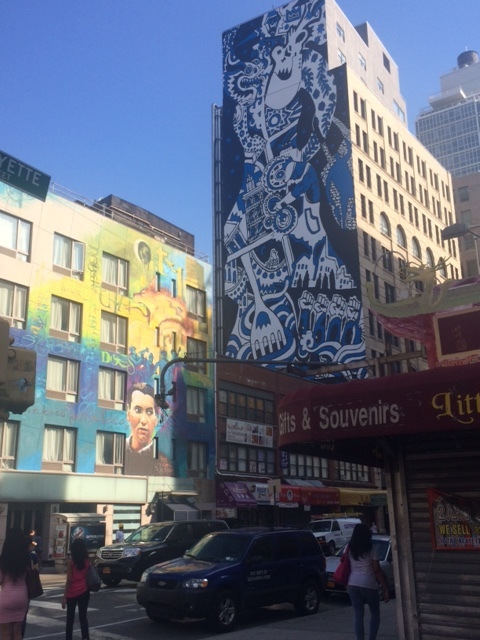 My Irish bard, host and tour guide was flat out when I slipped out of his apartment after 8:00 a.m. As a rule, New Yorkers are not early risers. I stopped at a Chinatown bakery for one of my favorite breakfasts: an assortment of buns. Then I rolled towards the Battery to see the new Calatrava Path Station. 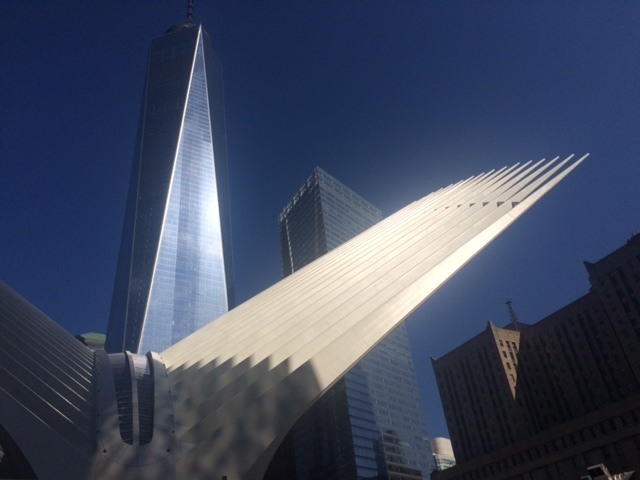 Perhaps it’s not fair to judge the winged sculpture that sits atop a station whose entrances seem as ordinary as any before it is fully complete, but did New York really need a bigger version of what Milwaukee already has? It is gigantic and it is graceful, but it is also arbitrary. It will make for dramatic photos among the angular crowd. The ferry to New Jersey is a delight. 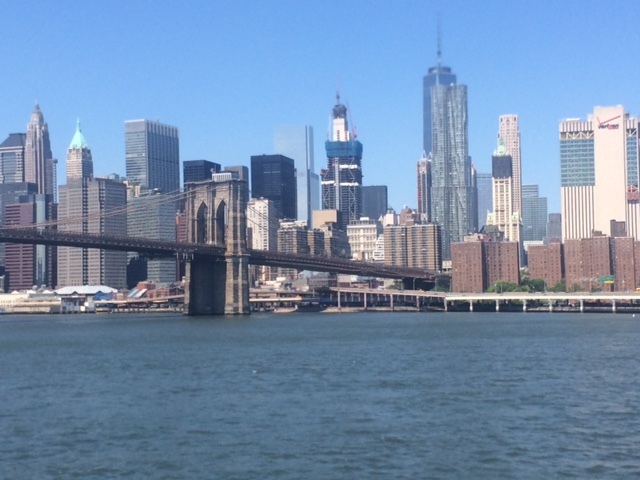 I was pleased that it churned up the East River for another stop at 34th street, so I got to see the Brooklyn Bridge and Frank Gehry’s apartment tower, which required a custom window washing machine to clean 84 floors of curved glass. 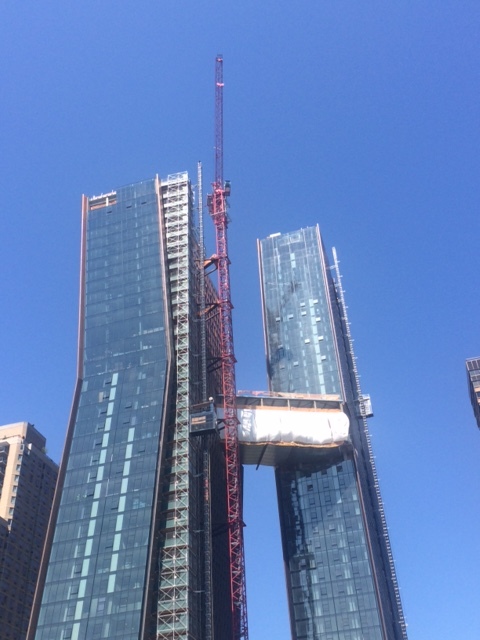 New York is the epicenter of one vein of architecture I detest: random forms of technical wizardry. Just because we can do something – technically – doesn’t mean it’s always a good idea – humanly. No matter. Within half an hour I was on the beach! 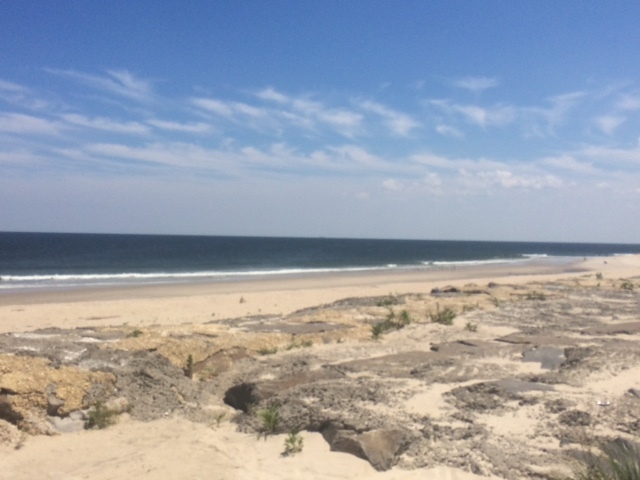 Hooray for Sandy Hook National Park and the fabulous Jersey Shore. The beaches are so pristine. 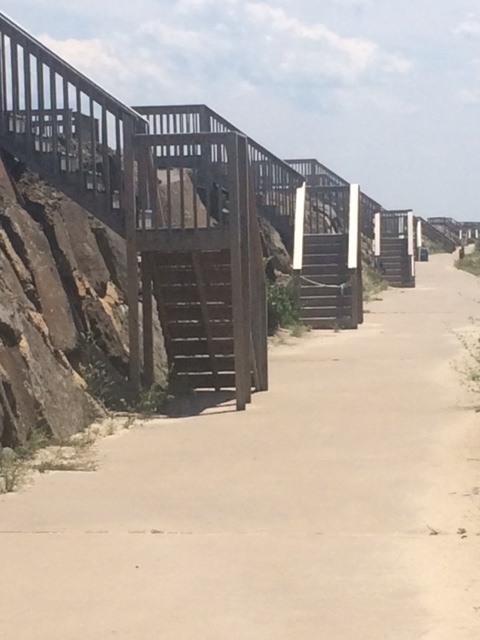 Along Sea Bright, a huge stone wall separates the beach from the rest of the barrier island. I’m not sure how much it helps in a storm. Seems to me the water will come in from the marsh and bay on the other side. But people have built their private decks up on the top of the wall just the same. The next three days will be ripe in nostalgia for me as I head to Toms River, where I grew up. First bit of memory: I got stuck at one of New Jersey’s raised bridge. They are quirky as ever. 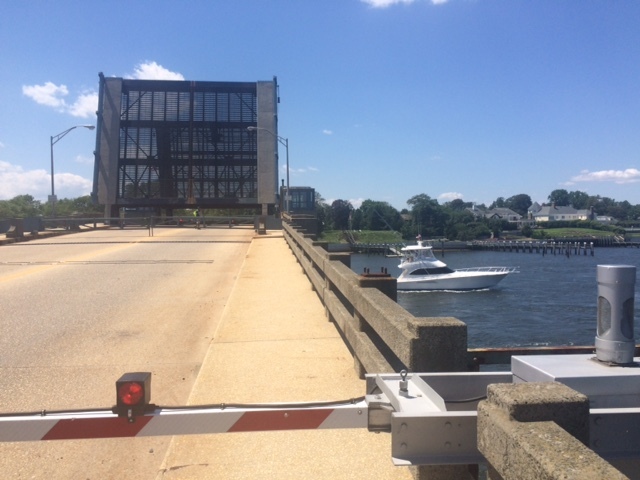 Two people in yellow safety vests scamper across the roadway and close gates by hand before raising the dual cantilevers that allow a pleasure fishing boat to motor up the Shrewsbury River while dozens of cars sit in the stifling heat. I pedaled through the tony boroughs of Rumson and Fair Haven, singing Springsteen songs (he long ago left Asbury Park for these greener pastures). I’m hungering for some Glory Days. This entry was posted in Bicycle Trip Log and tagged Calatrava Path Station, Gehry NYC, Red Bank NJ, Sandy Hook NJ. Bookmark the permalink.